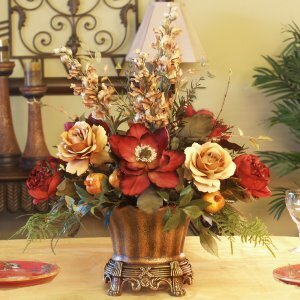 I ordered this arrangement and requested it in a bigger size. I received it two days ago and it is "gorgeous", the flowers are big and so lovely, the colors match beautiful my decoration and the size is just perfect for my dining table.I am a very happy satisfied client. Sharon did an Excellent job. Everyone that has seen the arrangement has commented on how beautiful it is, I am very glad that I found "Floral Home Decor". I will definitely buy from them again and recommend their store.